Essentially a historical fantasy revolving around the offspring of a Frankish woman allegedly raped by a Saxon demon wolf warrior, Catherine Spader’s engrossing narrative is a blend of medieval fiction and Germanic myth and folklore. 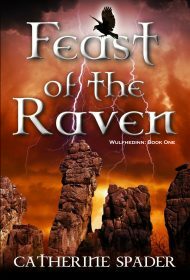 Superbly written and impeccably edited, this page-turner, the first installment of Spader’s Wulfhedinn saga, is comparable to bestselling releases by iconic writers such as Sharon Kay Penman, Guy Gavriel Kay, and Chelsea Quinn Yarbro. Set in 782 AD Germania and told in first-person narrative, the story features Gerwulf, a man without a clear identity. Although his father was a “wild pagan,” Gerwulf was baptized as a Christian and even raised in a monastery for a time. But after defying God and embracing the wolf spirit inside of him, he was excommunicated from the church and banished into the wilds. Conflicted about who he is—a cursed beast or a proud warrior of Wodan—and where his destiny lies, he becomes entangled in the political machinations of Karl the Great, King of the Franks, when he returns an invaluable sacred relic to the king. He then finds himself an unknowing weapon against a group of Saxon rebels who refuse to convert to Christianity and continue to worship the old gods. Caught between warring cultures and opposing religious ideologies, Gerwulf sets out on a brutal journey of self-discovery that ends with more than a few bombshell revelations. Spader is unquestionably a talented writer: Her writing style is fluid and at times lyrical, her description of northern Germany meticulous and fully immersive, and her knowledge of folklore extensive. But it’s her characters that make this novel so readable. Interesting and emotionally compelling, they are certain to resonate with readers. Some may be disappointed with the book’s conclusion. More like a respite, rather than a formal ending, it offers little resolution. But readers will quickly forgive the lapse if the second book is as stellar as this one.